A-E- Defenders; F-M-Attackers. 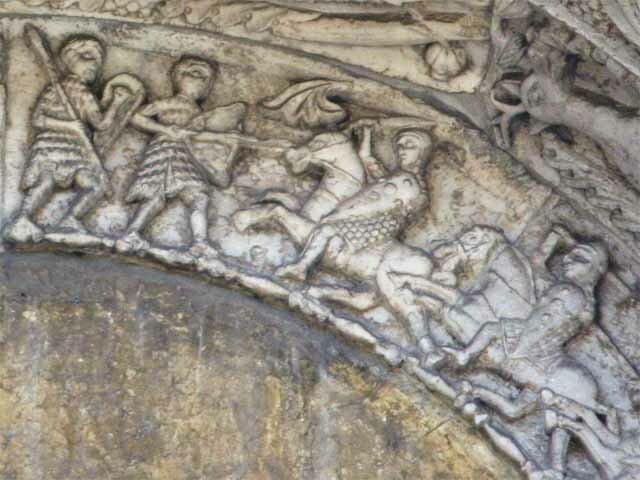 Various interpretations have been suggested for this carving which shows horsemen attacking a city, four from each side, while the defenders emerge on foot to challenge them. 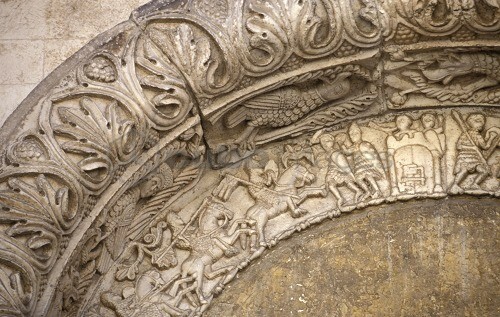 It could represent the Norman capture of Bari in 1071, in which case the defenders would be Byzantine, or the Norman capture of Palermo in 1072, in which case the defenders would be Muslim. It could also portray the capture of Antioch in 1098, in which case the attackers would include Italo-Normans and other Crusaders; the defenders, of course, being Turks. Finally it could portray the Crusaders' capture of Jerusalem in 1099, in which case the defenders would be Fatimids. It is a pity that the identity of the subject, and thus of the participants, cannot be more precise, as a number of unusual pieces of military equipment are included on the carving. The defenders are obviously shown as 'aliens' or 'infidels.' Four seem to wear small turbans (A and C-E), one over a probable mail coif (C). The fifth defender has a normal conical helmet which, in, common with all the other helmets on the carving, lacks a nasal. It is also worn over a mail coif which may be a separate piece of armour, as a mail hauberk without a coif is worn by another defender (A). Three figures (B, D and E) wear long cuirasses of scale or lamellar construction with short sleeves. The likelihood of strong Byzantine influence in Apulia and the probable Islamic identity of the figures in question make lamellar more likely. Large, kite-shaped shields are used by the defenders (A-D), who are also armed with a broad, non-tapering sword (A), spears (B and D), a rock or possibly a fire-grenade (C), and a remarkably inaccurately-carved bow (E). Whatever the exact identity of these figures, local prototypes were probably used by the artists. These could be the Byzantines themselves, if the scene shows the fall of Bari, or the Muslims of Sicily if the collapse of Palermo, Antioch or Jerusalem form the subject. The attackers are divided into two distinct groups. The men dressed in short-sleeved mail hauberks and coifs attack from the left (G, H, J and M), men wearing mail (F) or presumed lamellar (K and L) or a mixture of both (I) attack from the right. The reason for this distinction is unknown. One man wearing a presumed lamellar cuirass does so over an apparently long-sleeved mail hauberk (I), the only such long-sleeved armour seen on the carving. His lamellar cuirass also seems to have a kind of flap to protect the side of his head. The two other cuirasses also include lamellar to protect the sides and back of the head (K and L). This must indicate a form of aventail, as a helmet could hardly be worn over a lamellar coif even if such a piece of armour existed. Two of these cuirasses have half-length sleeves (I and K), while the third appears to be sleeveless (L). Helmets include the simple pointed conical type (K and L) and a rounder form, perhaps fluted or segmented, with a slight forward tilt to its outline (G, H, I and M). The spears have no flanges or wings. One bears a gonfanon (G) while another may do so (H). Swords are broad and non-tapering and have varied quillons though these are generally rather difficult to see (E, I and L). It is also worth noting that the men attacking from the left all use spears, while three of the four on the right wield swords, only one handling a lance. Those shown with shields all carry typical early 12th-century kite-shaped forms with bosses (F, G, I, K and L). 577A and 577B. 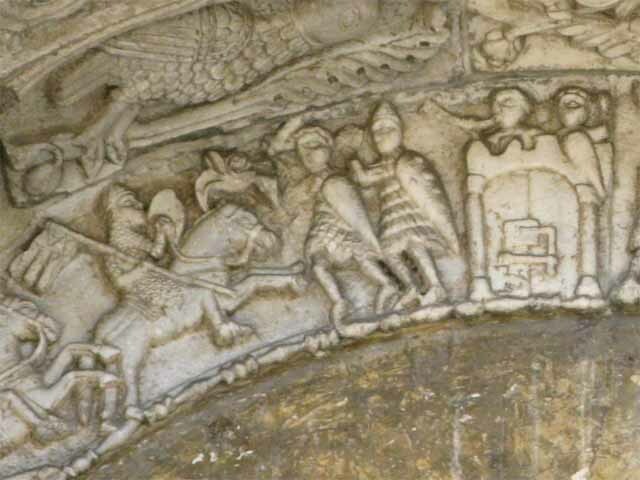 Relief, A - "Defenders," B - "Attackers," Capture of Jerusalem in First Crusade (? 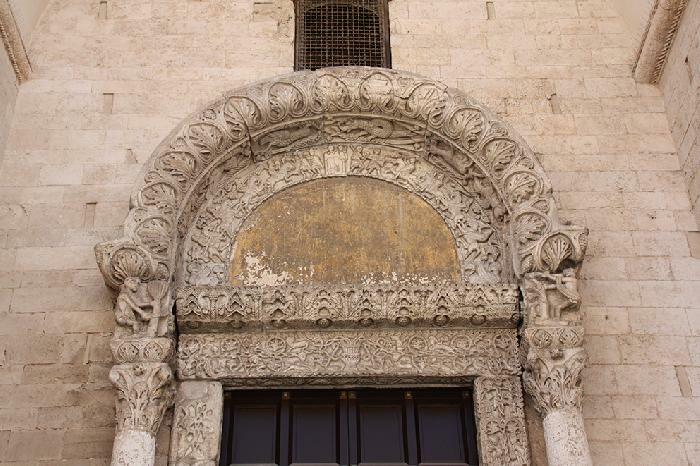 ), early 12th century AD, Italo-Norman, in situ, north door, Church of San Nicola, Bari. 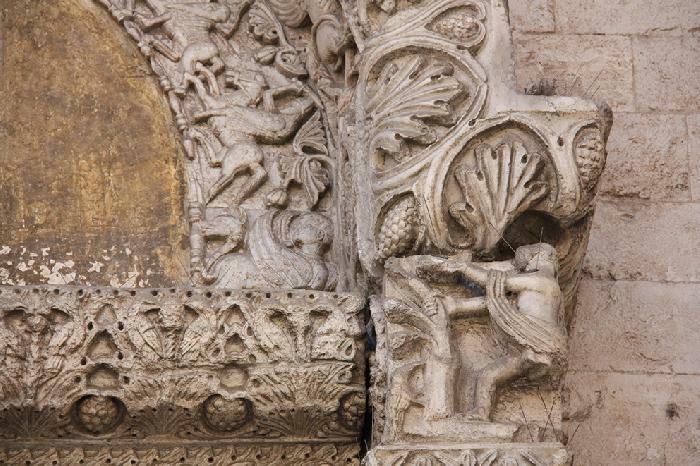 Norman knights from a porch at the church of San Nicola at Bari, c. 1087. The city of Bari, the Empire's last stronghold on the Italian mainland, fell to the Normans under Robert Guiscard in 1071. The figures are very similar to those in the Bayeux Tapestry. Note both underarm and overarm use of the lance.